Motorsport merchandise with the team logos is available in official shops only. It's not difficult to find where these are. But for why, because I put all official online shops together especially for you. So, let's try to find something interesting, memorable. Ready? Take a note, suddenly come in handy! First and the most official at all. We all know about it heard and saw it, so WRC. Features: standard shipping methods (DHL), easy payment (PAYPAL). Although there are the same payment methods everywhere. Prices a little bit high compared to the other online stores, but there are different promotions and sales are very often (in time before WRC stages for example). However, there is the largest range of Motorsports accessories. What did I like? I'm not a fan of clothes with logos but interested in small things for my friends. Here are USB cards, bracelets and belts, and other little things, nothing special but nice. Everything becomes much easier and clearly when you're a fan of the one Motorsports team only. 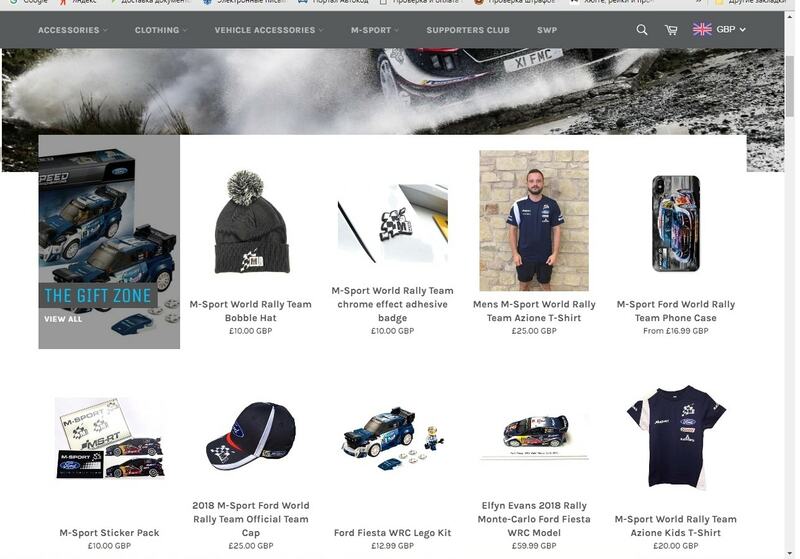 By the way, you could find some of your favorite team accessories at WRC shop website too. There are HMSG, TGR, Citroen, links attached. 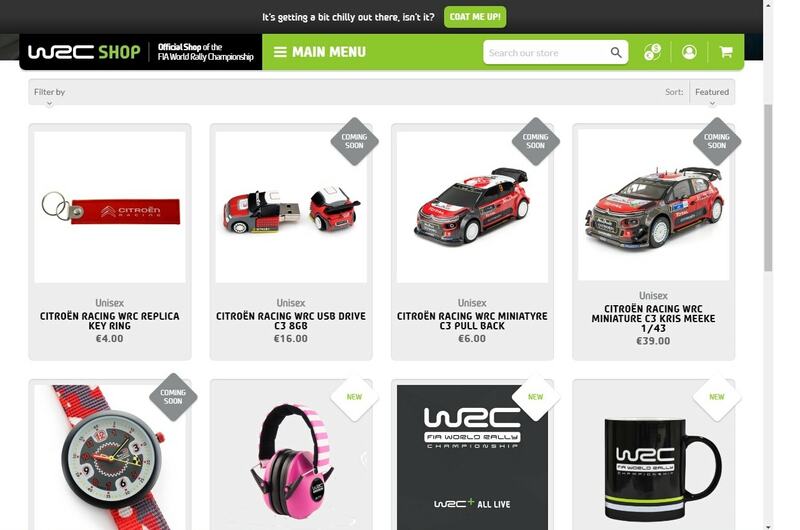 Therefore we'll be talking about the official WRC Teams online shops. 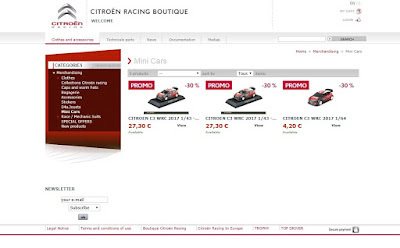 Our first brand store is Citroen Boutique of Citroën Total WRT. Features: personal delivery terms, sometimes isn't comfortable; payment cards. Prices: as you can see in the picture below, prices are lower. Promotions and sales are profitable for those who subscribed to the news. Discounts aren't so often, especially before the holidays (I checked once for 2 months ). What did I like? The range isn't so large, but you can find something unique and inimitable among these. 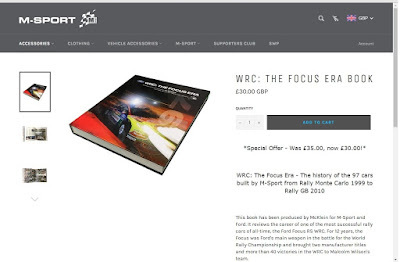 I've been seeing M-Sport Ford WRT merchandise ads not so often like any others too. Anyway, I think the best Ford sports merchandise is at the main Ford Performance website. Pay attention, we talking about M-Sport accessories. It's not the same. Features: standard shipping methods, it's not always convenient, but some things will have to wait for. There is an easy payment (MasterCard, Maestro, Visa). Prices exactly are the same compared to Toyota Gazoo Racing. I'll be honest with you, so didn't find any special offers or promotions. You need to choose the product for promo offers. It's not an easy website, I wasted some time to understand how it works. Note: it would be more good if you'll be knowing what you need to find before this website will be opening. What did I like? The range is very good. I think it's the best shop for accessories. There are books, some caps with 'Hoonigans' logo (very popular in Russia). There are a few official websites with online stores, that you have to pay attention because we searching for unique accessories. 1. Main company's website. You can leave a request for the goods only. To be honest, I have no idea how it works but looks like you leave a request form and get the opportunity to take your 1 - 100 umbrellas (for example) from your dealer. Same steps would be easier on WRC official. 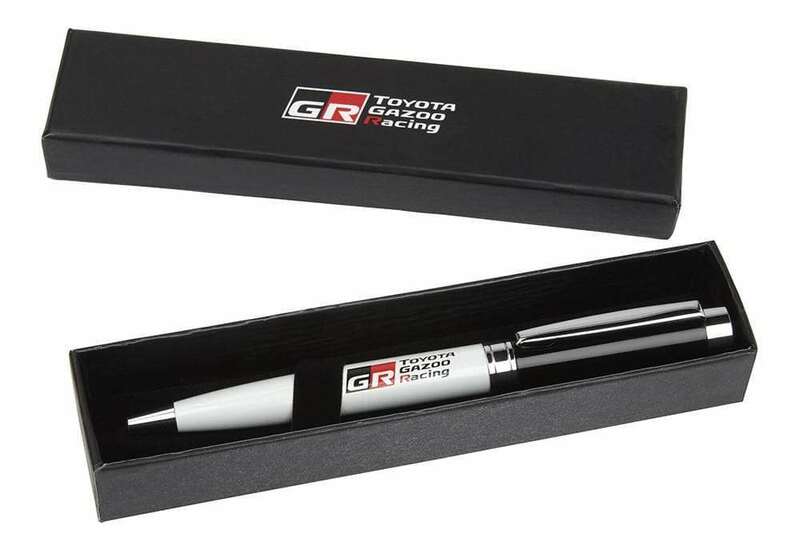 Write to me if you'll get to know how it's going on, before passing on WRC official shop of course. 2. Official online shop. It is available to find Hyundai merchandise products. Features: comfortable payment terms, individual delivery terms, but it's possible to discuss if you'll rewrite a request in the main web source (link above). 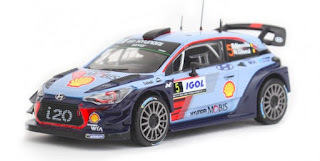 Seems that the range of accessories are being at the main WRC official shop and there is nothing special I found. Prices are the same as at official rally shop, no special offers or promotions. What did I like? I noted Hyundai Motorsports direction' guys are open to dialogue with the fans. So, you could try to order everything you've ever seen with Hyundai Motorsport logo. A real size car number 5 will be too big in my flat, but a small copy would be very useful. 3.Official website of the sports direction. I have good news for you. You could request the autographs. 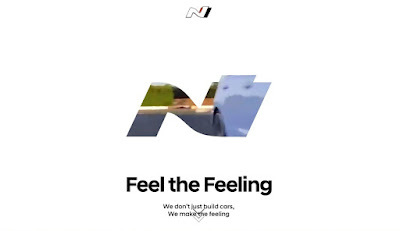 The website is definitely for Hyundai Motorsport logo fans. Anyway, it would be more good if you'll be knowing what you need to buy before this website will be opening (as in the case with M-Sport). P.S. 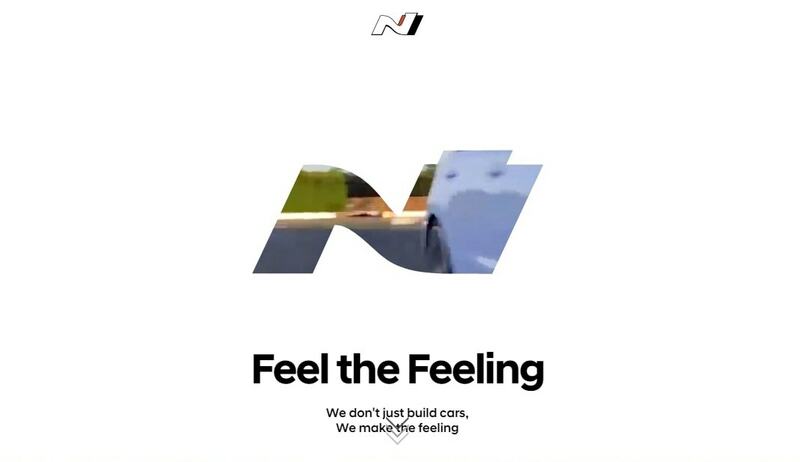 'We don't just build cars, We make the feelin..' I think the Hyundai company is preparing to build their own sports cars empire. Don't know the truth, but they already writing the "take on the world" plan for sure. As for the other miniature cars, you can find a lot of models cars at the official Toyota Gazoo Racing store. There are a lot of things, clothes, and accessories: towels, pens, belts, phone cases. Features: Very easy to use website, the range is very good. Standard shipping methods (DHL), easy payment (PAYPAL). Prices are the same as WRC official shop. But I think you would choose the last, because of interesting offers. What I did like? 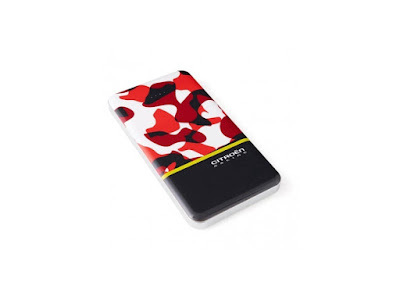 Generally, the online store was made with high-class quality. There is a good description. However, I would like to find more accessories, was a little bit difficult to choose something, but that's nitpicking. By the way: all other references to stores you can find on Autosport and Motorsport official websites. Important: do not forget to look carefully at the delivery area. Not all official shops send goods to some countries and cities. However, the official Red bull racing store doesn't to mine. Now you tell me, do you like shopping? Do you like 'nothing special but nice' things? No Comment to " WRC Official Merchandise online shops "